An accurate depiction of blood flow through the chambers of the heart. 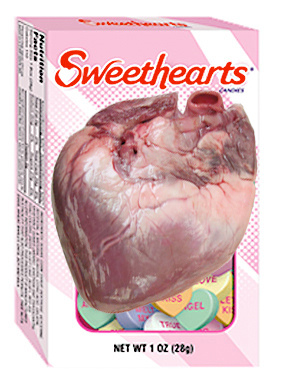 Necco has even produced candy made from hearts. How delicious. This article is about the organ in various animals. For the subject frequently confused with by people born after 1980, see Pat Benetar. The heart is an organ in the human body. No, not that one. North of there. No, that's your trachea. Yes, there it is! Blood flows throughout the body, just as my soul flows throughout the universe. Wow. As blood flows through the heart, the heart heats it to the apropriate temperature. This prevents your brain from freezing, though this can be cured by drinking slurpees, slushies or even icees. The heart is able to do this because it contains all of the love within the body. This is why people in cold countries (such as Swedes and Eskimos are such affectionate people, since if they stop loving they'll freeze to death. People from hot countries such as Mexico can afford to be less loving, which is why they won't return my calls. Hypothermia. Caused by conditions of extreme cold or sometimes even X-Treem cold. The blood cools, causing the heart to become depressed and shut down. Treatment requires immediate heartwarming, such as Disney movies, or exposure to puppies. Heart Attack. Can be caused by red meat, cigarettes and alcohol, but it is usually triggered by tofu abuse. Cured with electric paddles. Cool, no? 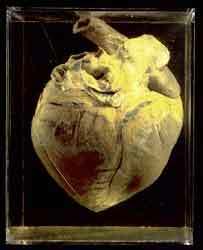 Angina. A good name for a girl. St Angina is the patron saint of TV cop shows. Broken Heart. Caused because girls have cooties. So there. Lonely Heart. Fortunately, it is considered to be better to be an owner of a lonely heart than an owner of a broken heart. Grinch's Disease. A terrible condition in which the heart grows up to three sizes in a day. This can cause the lungs to collapse or in X-Treem cases, the chest can burst open like in Alien except instead of an alien out pops a heart. There is no known cure. Please give generously to the Grinch Foundation. Ghandi's Syndrome. Also known as Mother Theresa's Malady, Osmondism or Jimmy Carter's Disease. Caused by excessive niceness, the patient becomes literally "all heart". With no ribcage for protection or stomach to digest food, the patient soon dies. Heart/Spork Disorder. A rare condition, believed to be caused by being brutally stabbed in the heart with a spork. The only known cure is to prevent anyone stabbing you in the heart with a spork. This is why I always keep a shotgun loaded, and never leave my shack. Some humans are said to be "heartless" and, therefore, have no heart. In its place are a bunch of rocks. This Anatomy-related article smells funny. You can help Uncyclopedia by giving it a bath.